Gerard Kearns and Elinor Lawless in To Have To Shoot Irishmen. Images Mike Massaro. 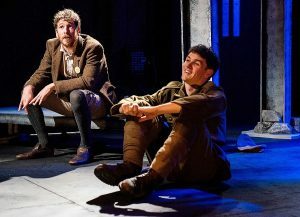 Inspired by the events of the 1916 Easter Rising, Lizzie Nunnery’s To Have To Shoot Irishmen which opened on Thursday at the Omnibus Theatre, Clapham, offers a damning look at militarism, violent revolution and a Dublin community torn apart by conflict. Weaving together theatre and folk song, Nunnery’s latest play begins with Hanna (Elinor Lawless), a head-strong revolutionary and feminist activist, wandering the streets in search of her missing husband, Frank (Gerard Kearns). Unlike Hanna, Frank still believes in non-violent revolution. As the rift between them widens, Kearns and Lawless’s unflinchingly honest performances expose the painfully pertinent reality of a divided Ireland. To Irish Republicans, Frank is a traitor for refusing to bear arms. To the British military, he’s a dissident who disturbs the peace, and they arrest him without cause during the chaos of the rebellion. countryman but refuses to budge from either his post or his politics. 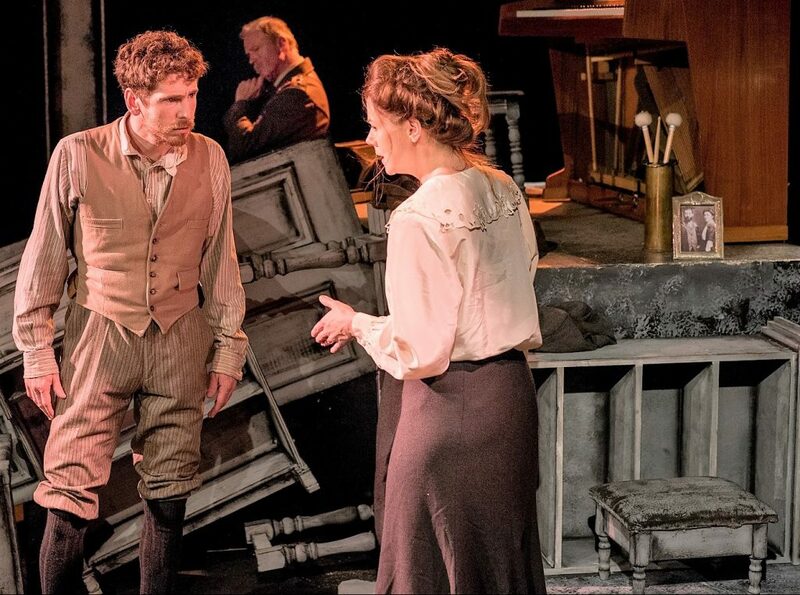 At turns hopeful and searingly desperate, the play thoughtfully explores the motivations of those affected by the rebellion and, through Frank, questions the merits of ‘organised death’ as a tool for securing peace. 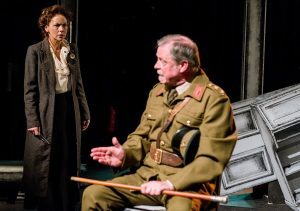 As a soldier determined to do his duty, O’Neill’s unsteady eagerness provides a compelling contrast to the soapbox resoluteness of his detainee, who he calls a ‘crank’ and a ‘pan-banger’ for his outspoken pacifism. But the real ‘pan-banging’ comes from Russell Richardson, whose convincing performance as Vane – a British commander seeking absolution – is somewhat stifled by his inability to tap a beat against a piece of furniture. Nunnery’s ‘play with songs’ delivers occasionally on the song element, with original music composed by Vidar Norheim, appearing between scenes alongside songs of the period. The story might well have worked without out them. 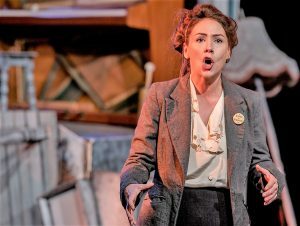 But the new lease of life breathed into old anti-enlistment songs, such as The Grand Ol’ Dame Britannia, help enrich the historical texture of the play and deepen its emotional tone. Staged amid the rubble of a bombed-out home, designer Rachael Rooney’s set recalls a broken remnant of a broken community, echoing Frank’s concerns as to how any of this might be rebuilt. To Have to Shoot Irishmen runs at Omnibus Theatre until October 20 before touring to Everyman & Playhouse (Oct 25-27); Marlow Studio Theatre (Oct 30); Theatre Severn (Nov 1-2); Mumford Theatre, Cambridge (Nov 5); The Arts Centre EHU (Nov 6).